If seeing Venom bastardised the way he was in the lacklustre Spider-Man 3, fear not because word is that fan favourite acclaimed Actor Tom Hardy has landed the role of Eddie Brock in Sony’s upcoming Venom stand alone film in their planned Spider-Man Universe! According to multiple outlets, the forthcoming spinoff of Spider-Man's comic universe will pair the actor with Zombieland director Ruben Fleischer, the Venom film and a Black Cat/Silver Sable team-up will be launching a new shared universe for the Spider-Man family of heroes and villains, although at this point it's not exactly clear if Spidey will actually appear in either of them. Sony currently has a deal with Marvel Studios for Tom Holland's version of Spider-Man, who debuted in last year’s fantastic Captain America: Civil War and will feature in his upcoming solo adventure; Spider-Man: Homecoming and its sequel as well as the next two Avengers outing, kicking off with next year’s Avengers: Infinity War. As it stands however Marvel Studios is not involved in Sony's spinoffs. 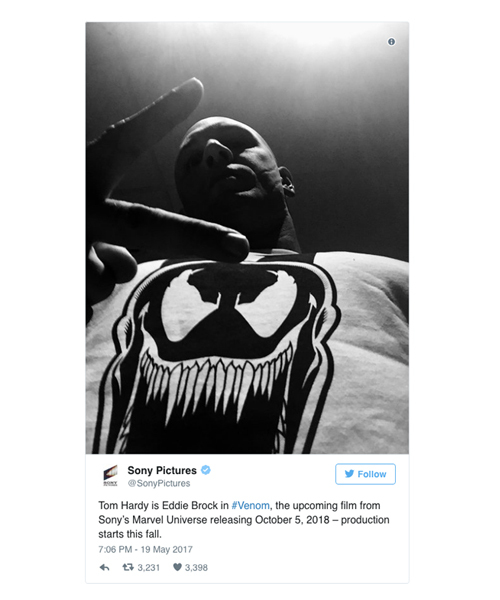 Hardy’s role of Venom will presumably require the sought after Actor to bulk up beyond Bane levels of buffness, despite the fact that he's previously complained that frequent physical transformations for past roles had "damaged his body" and recently joked "I'm only little, if I keep putting on weight I'll collapse like a house of cards under too much pressure." Hardy is no stranger to Comic Book fare, after portraying the aforementioned Bane in The Dark Knight Rises he was briefly linked to the role of Rick Flag in David Ayer’s Suicide Squad, but scheduling issues led him to drop out before filming. Eddie Brock is the most famous incarnation of Venom, who in Marvel Comics lore was a journalist and body builder who developed a grudge against Spidey for foiling his career-making theory about a serial killer. Brock's hatred drew Spider-Man's own former alien symbiote to him, transforming him into a virtual rage-monster obsessed with killing the web-slinger, a depiction of sorts was seen in the aforementioned Spider-Man 3. At first a villain, Venom later transitioned into an anti-hero and even joined forces with Spidey from time to time, most notably to take on his offspring Carnage and the other Symbiotes. Hardy can next be seen in Christopher Nolan’s Dunkirk as Farrier this July alongside his Inception, The Dark Knight Rises and Peaky Blinders co-star Cillian Murphy.